Although he was a successful portrait painter at Bath and London, Gainsborough's passion was for landscape drawing. He sketched endlessly to find a pleasing composition in which certain simple elements – road, pool, figures, cattle, trees – recur time and time again. 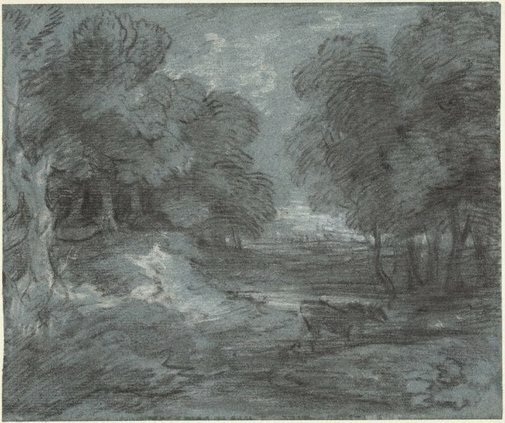 Gainsborough's landscape drawings, with their swaying trees, blurred outlines and soft atmospheric effect, are not so much topographical records as poetic recreations. The blue paper provides the middle tone which is modulated by black chalk and white chalk. Peter Raissis, Look , 'Early European works on paper', pg.20-23, Sydney, Aug 2014, 22 (illus.). Forest and field: from Claude to the Barbizon School , Sydney, 1995, 3 (illus. ), 6.